Focusing on the early days of Captain America's regime, the new spotlight on the Inhuman, Inferno, gives this story a powerful character arc to follow. While the rest of the characterization does falter, the art and compelling plot make this a must-read for any SECRET EMPIRE or INHUMANS fans. With so much controversy surrounding Captain America, Marvel has a lot of ground to cover to make SECRET EMPIRE work. A Captain America-led Hydra has taken over the US government. In no time, the country has bowed to its new leader without question. Since that fateful day, America’s greatest heroes have been forced into hiding. 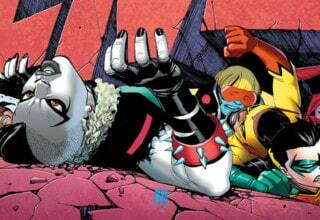 As a tie-in, SECRET WARRIORS #2 succeeds at developing this new world order. It does so by thrusting the reader into the early days of the new regime. With a cast of Inhumans, Matthew Rosenberg has developed a plot delving into prison camps and prejudice. SECRET WARRIORS #2 is an action-packed, cross-country road trip. But does it provide the depth needed to further the story of the fallen Captain? SECRET WARRIORS #2 opens on a flashback. 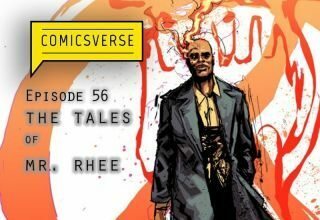 The story begins in the early days of the takeover, following Inhuman pyromancer Inferno and his allies as they watch the new leader of the Inhumans, Iso, get arrested by Hydra forces. At their head is Dr. Calvin Zabo, aka Mr. Hyde and Daisy Johnson’s father. In further flashbacks throughout the issue, we find our frightened Inhumans on the run. Hiding in Philadelphia, Hydra forces discover the snake-skinned Naja, drawing the young supers into a battle they cannot win. Spaced between these flashbacks are glimpses of the present day. 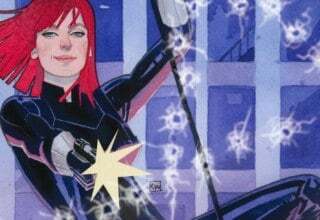 After liberating an Inhuman Prison camp and saving former royal Karnak, Daisy Johnson and her fellow Inhumans are on the run. Searching for answers and a particular someone, Daisy, Inferno, Moon Girl, Ms. Marvel, and Karnak hit the road with Devil Dinosaur in tow. Although not specifically named, evidence from SECRET WARRIORS #1 would suggest they’re seeking Phil Coulson. This narrative thread ends in a trap, as a Hydra team led by the Howling Commandos attacks from all sides. During this fight with the supernatural soldiers of the Hydra team, Inferno burns out and gets injured by his own flames. After his black out, he awakes as the team is leaving the United States on the road to meet the X-Men. Of the many highs of this story, the art stands out in particular. Javier Garron’s pencil work is spot on throughout the piece. His style carries such energy, and there is such a distinct visual difference in the characters’ ages. 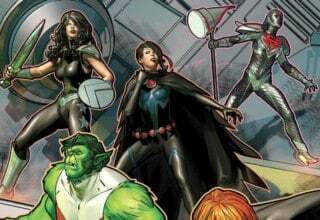 While this may seem like an obvious end goal, the characters are all very similar in age with the exception of Karnak, distinguishing between the older teenaged Ms. Marvel and the adult Daisy Johnson is not a simple task. Garron shines brightest in scenes with many characters, namely the battle between the Secret Warriors and the Howling Commandos. So much happens in one panel in that scene, but Garron keeps it all from becoming a chaotic mess. READ: Follow the events leading up to Captain America’s rise to power with this review of CAPTAIN AMERICA Vol. 2! The plot in this issue held my attention from the start. The glimpses into the early days of the regime helped to answer some of the many questions that developed after reading SECRET EMPIRE #1. Also, the plot was very well-paced. Every story beat flows easily into the next, and it all reads very smoothly without any hiccups. The road trip aspect of this story greatly aids this feeling, giving a natural downtime for character interaction and for gradual timeskips. The jumps between flashback and present day were very clear, and I personally had a ton of fun seeing Rosenberg lean on some of the Marvel Universe’s lesser known characters. The brief cameos of Dum-Dum Dugan, Orrgo, and Vampire by Night added a little intrigue into the story, but the eventual reveal of the X-Men showcased many lesser known faces as well. With so many characters introduced in to this story, characterization is key to making the story stick. For SECRET WARRIORS #2, the main character focus fell on Inferno. For the most part, Rosenberg nailed it. In only 27 pages, Rosenberg built an entire character arc for this burning hero. Through flashbacks, we see the young man fleeing while Hydra captures his friends. We don’t understand the strength of this moment until Inferno nearly dies saving his new allies. We get to see him gain the will to tackle Captain America’s regime. Moon Girl also has some strong characterization. Her inclusion poses a lot of risks. In her main series, her greatest threat was a teenage Kree soldier with a crush on her. Despite being dropped into a war story, Lunella isn’t out of place because she brings a welcome dose of innocence to the group. Moon Girl’s innocence is welcome because it fits her character. She is a young hero, so her focus on music or the baboon in the Howling Commandos feels on point. As for the rest of the cast, characterization falls flat. There is this injected silliness that didn’t fit the overall tone. While Marvel’s heroes aren’t afraid of punchlines, the stories rarely devolve into silly moments. When the team stuffs Devil Dinosaur into a horse trailer, that comes off funny and adorable. When Ms. Marvel and Daisy Johnson drool all over themselves while sleeping, that’s silly. Even some of the character interactions seem distinctly misplaced. Karnak has always carried himself with discipline. His dialogue here almost comes off as childish or detached. Characterization falls apart because unlike Moon Girl, he does not match former appearances. For a story focused on saving people from prison camps, the humor comes off a bit thick. READ: The rise and fall of the Inhumans leader! Learn about Black Bolt’s mistaken imprisonment in BLACK BOLT #1! SECRET WARRIORS #2 was a fun story to dig into, and with its ties to the main SECRET EMPIRE story, it is a must-read for full immersion into the event. Some minimal characterization and out of place dialogue kept the story from reaching its potential. However, the primary focus on the early days of Captain America’s regime and the current plight of the Inhumans gives this arc more credence than other tie-in stories. With beautiful, high-energy art from Javier Garron, SECRET WARRIORS #2 helps this story become a true-world building adventure that can duck into the deepest shadows of Captain America’s new world order. Whether you are a fan of the Inhumans, Daisy Johnson, Ms. Marvel or Moon Girl, this story is for you. During the review, you wrote about Karnak: “Characterization falls apart because unlike Moon Girl, he does not match former appearances.” Yeah, no kidding. That can be also applied to the long-awaited (4 years!) 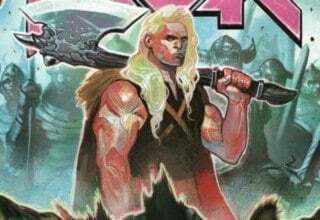 cameo appearance of Rictor or, should I say, “Freddie Mercury Reborn”. I could kick Garrón in the foojkies for giving him a Pornstache™ and really bad uniform. Gah. My eyes! All in all, NONE of the Inhumans interest me and this series is no exception. The revelation of the X-Men on New Tian, however, may promise work by another creative team that I would definitely be interested in.